Generally, Indians made cuts to the bark of trees creating a marked ‘Indian Path’, its long usage established a well-beaten path. The most thorough written material on “Indian Paths” comes from Wallace, Paul, A.W., “Indian Paths of Pennsylvania”. Delf Norona, “Eighteenth Century Paths, Roads Or Trails”, Upper Ohio Valley Historical Review, Vol. 1 No. 1 October 1968, takes his history mostly from the Wallace book. Wallace documents the main Indian Paths, omitting the history of many of the lesser used paths. Hutchins, Lt. Thomas, “Courses of the Ohio River” 1766, writes of a few Indian Paths. 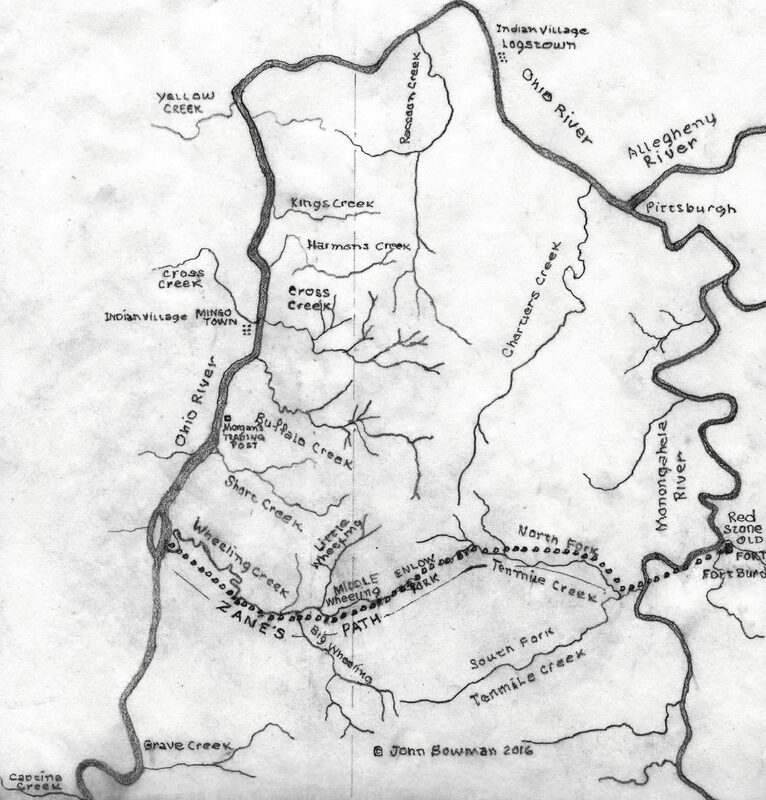 INDIAN PATHS, Nemacolin’s Path ran west from Wills Creek, Fort Cumberland, Maryland to Nemacolin’s village at the mouth of Dunlap (Nemacolin) Creek. Here was located Fort Burd, Red Stone Old Fort on the Monongahela River present day Brownsville, Pennsylvania, and this is where our history finds its interest. 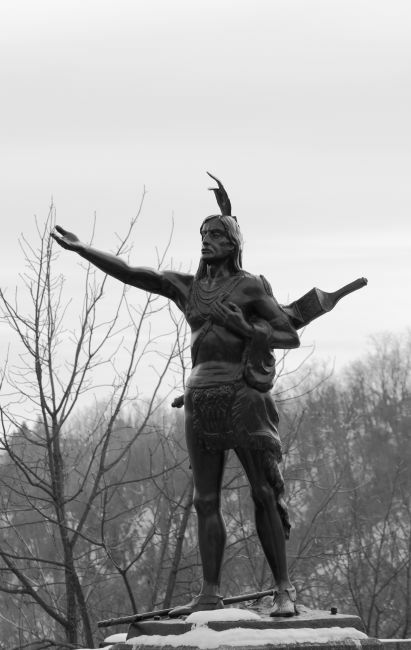 Nemacolin’s Path was named for Chief Nemacolin of the Delaware Nation. Nemacolin helped Thomas Cresap widen a Native American path across the Allegheny Mountains to the Ohio River Valley. The National Road, old Route 40 follows the Path’s general course to Brownsville. Nemacolin’s Path east of Uniontown, branched north from the Half King’s Rock, (Iroquois Half King Tanacharison) onto the Catawba Path, which it followed to Jacob’s Creek where it turned west onto the Glades Path, following this latter to the Forks of the Ohio. At Half king’s Rock, General Braddock followed this path closely, to within six miles of Fort Duquesne at Pittsburgh. 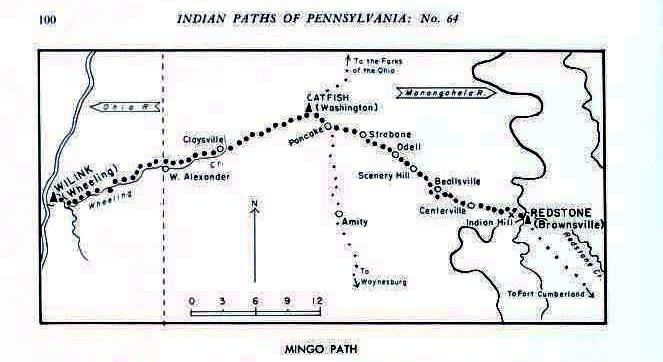 The Mingo Path was a western continuation of Nemacolin’s Path. It ran westward from Red Stone Old Fort, (Brownsville, Pennsylvania) to Wheeling, Virginia. The National Road (Route 40) somewhat followed this path on through Ohio to Kentucky. The eastern section of this path from Brownsville to Washington, Pennsylvania was at times, referred to as part of the Catfish Path. The Mingo Path evolved into a bridle path, later a wagon road known as the old ‘Portage Road’, and early on before the opening of the National Road, this path became the main wagon road to Wheeling. Wallace in his book, “Indian Paths of Pennsylvania”, on page 100 maps the Mingo Path. This map (No. 64) centers on Catfish with the Mingo Path coming from Red Stone Old Fort to Centerville, Beallsville, Scenery Hill, Odell, Strabane, Pancake, Catfish (Washington) and on westward to Claysville, West Alexander and Wilink (Wheeling). At Catfish, (Washington) the Catfish Path intersects the Mingo Path and runs south to Amity, and Waynesburg, and from Catfish, the path runs north to the Forks of the Ohio. Lesser paths branched off the main Mingo Path. One often-used branch ran north-west from the headwaters of the North Fork of Tenmile Creek to present day West Liberty. From there it crossed over ‘Apple Pie Ridge’ and then to a small run, a tributary of Buffalo Creek leading on to its mouth on the Ohio River at present day Wellsburg. Thereon the path ran north to the Seneca Indian village at Mingo town (Mingo Jct., Ohio). Ebenezer Zane in 1769 branched off the Mingo Path at the headwaters of the North Fork of Tenmile Creek and followed a small run, which emptied, into one of the sources of Wheeling Creek, the Enlow Fork, and then following the Mingo Path, he ended his trek in Wheeling. Paths Ancillary to the Wheeling Mingo Indian Path. The Catfish Path was named for an influential Delaware Indian “Tingoocque” (translation) “Catfish”. Catfish was an Indian camp that became Washington, Pennsylvania. From Catfish, (Washington) this path went north following along Chartier’s Creek by way of Canonsburg and Bridgeville to near Carnegie, and on to Shannopins Town, present day Pittsburgh. The path ran south from Catfish crossing both branches of Ten Mile Creek past Amity to Waynesburg, Pennsylvania and there it connected with a branch of the Warrior Path. The Glades Path joined with the Mingo Path at the Ohio River at present day Wheeling, West Virginia. The Glades Path followed the Mingo Path to Catfish, and extended eastward to the Raystown at present day Bedford, Pennsylvania. Traveling this path required one to cross the Monongahela River, and ford the Youghiogheny River at West Newton, Pennsylvania. 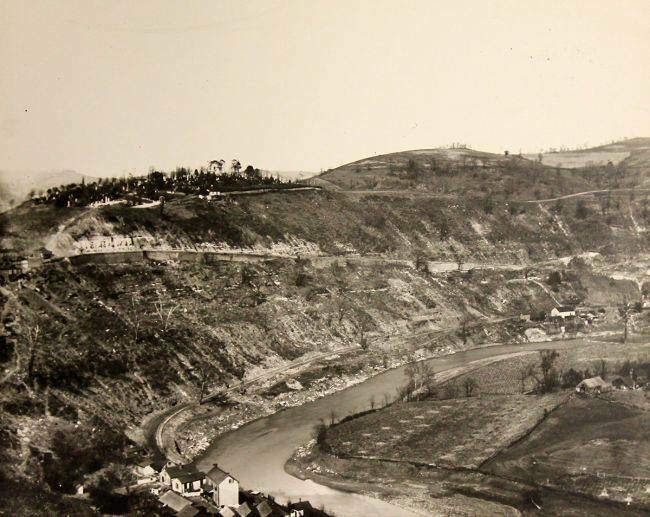 Other lesser waterways and mountains would have been encountered on the way between present day Somerset and the Juniata’s Raystown Branch. The Warrior Path, one of several that used that name was from Smithfield in Fayette County west to Moundsville, Virginia, (West Virginia) proceeding westward from a connection with the Catawba Path past New Geneva and through Nettle Hill and southern Greene County, Pennsylvania. This path has been researched extensively. Hutchins, Lt. Thomas, “Courses of the Ohio River” anno 1766, the Historical and Philosophical Society of Ohio 1942. Norona, Delf, “Eighteenth Century Paths, Roads Or Trails”, Upper Ohio Valley Historical Review, Vol. 1 No. 1 October 1968. Norona takes his history from the Wallace book. Wallace, Paul, A.W., “Indian Paths of Pennsylvania”, Historical and Museum Commission, Harrisburg, Pennsylvania 1965. Map: “Key to the Indian Paths of Pennsylvania” “The word “Trail” was not commonly used in the eighteenth century.